The opening comment of an “On Being” podcast made me stop mid-step. I’d clicked on an episode to listen while walking on a busy city street without paying much attention to who was being interviewed. Host Krista Tippett’s introduction sent me reaching for the volume button on my phone and adjusting my earbuds so I wouldn’t miss a word. Last summer’s death of an orca calf held the world’s attention for the seventeen days and 1,000 miles the calf’s mother, Tahlequah, carried her dead baby. That drama likely convinced large numbers of people that the Salish Sea is in trouble. The “ripping through our resources …consuming and not giving back” Earle describes has diminished food supplies (Chinook salmon in particular) for the orcas, shortening their lives and making reproduction and survival more tenuous. Oil tankers and other water vessels (including whale watching boats and ferries) cause noise that interferes with sounds whales need for communication and echolocation. Finally, toxins from oil spills, chemical contaminants, and plastics foul the water and food so vital to these mammals. I don’t expect I’ll ever live underwater, but the longer I ride and write on the Salish Sea, watch its tides ebb and flow, the more interconnected I feel with this system that dominates the world. And the more compelled I am to tell its story to help us all feel it—and take whatever actions we can to save it. I still have much to learn about the places where the sun never gets, and I’m grateful for teachers like Sylvia Earle. You can learn from her in this TED talk. Next on my research list is to watch “Mission Blue,” the Netflix documentary about her and her mission to teach people about the dire condition of the Earth’s oceans. This entry was posted in Salish Sea, Sylvia Earle. 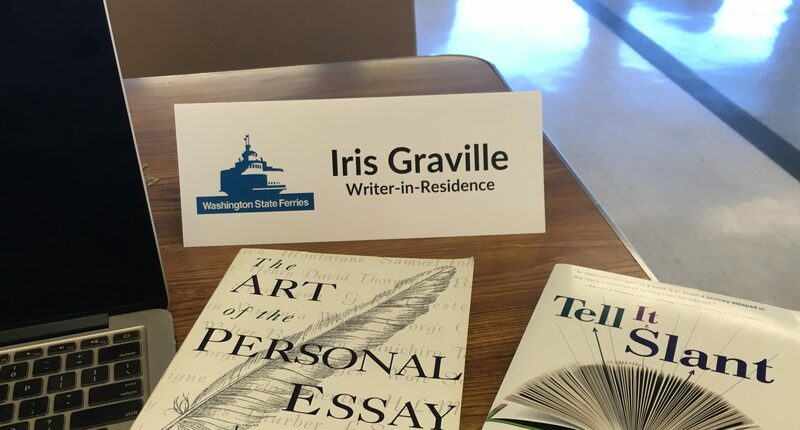 Tagged Essays, oceanography, Orca whales, Salish Sea, Sylvia Earle, Tillikum, writing. Thanks for this post, Iris. These truths can’t be said often enough. Much like the life in our soils, the living being that is our global sea sustains us at our foundations. We can’t treasure it enough. this is my favorite blog yet! So much in a short space; near poetry. It was a pleasure to ride with you as you read about her. Thanks, Kathleen! Your knowledge of Sylvia Earle’s work inspired me, too. It was so nice to have your companionship on the ferry; hope we can do that again sometime. “Earle wishes everybody could go live underwater, if only for a day.” This brought back a rush of memory: I was diving off Key Largo, in the ’80’s I think, and was surprised to see, at about 40 feet deep, a dome! There was a diver outside the dome, deep in his job of photographing a tiny fish buried in an anemone. I tapped on my tank, the only underwater communication devicd available back then, and she turned, gave me a high sign, and resumed her work. I was so envious ..I later discovered that it was a sort of SeaLab experiment of the Ocenaography Department of University of Miami. How amazing would it be to live underwater, even for a day! Wow! Love this story and imagining you diving off Key Largo.